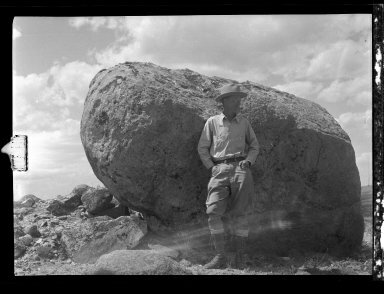 WyoFile published a great article yesterday on famed UW Geology Professor and Wyoming Citizen of the Century, Samuel Howell Knight, called “Sam Knight – The Great Geologist Who Could Take Correction From a Neighborhood Kid“. The article arrives on the heels of the AHC’s recent press release announcing the complete digitization of Knight’s photographs, which are part of the Samuel H. Knight Papers at the AHC. The digitized collection contains over 3,200 photographs from Knight, most scanned from glass and nitrate negatives. The subject matter of the images includes the UW Geology Museum, UW classes, construction of UW buildings, UW students and professors, UW Science Camp, excavations, fossils, and geologic formations, and even turn-of-the-century UW football games. The collection also includes several hundred photographs of scenery and towns from Knight’s extensive travels throughout Wyoming. You can check out Knight’s photographs, along with 40,000 other scans from a wide variety of other AHC collections, online at: https://digitalcollections.uwyo.edu/luna/servlet/uwydbuwy~22~22. This entry was posted in newly digitized collections, University of Wyoming, Wyoming history. Bookmark the permalink.